Earthworm populations were studied in three tropical agroecosystems of southern Mexico: improved maize with a Mucuna pruriens cover crop (MM), continuous conventional maize (CM) and pastures (P). Three replicates and six monoliths were sampled in each agroecosystem. Three earthworm species were found, two native (Balanteodrilus pearsei, Larsonidrilus orbiculatus) and one exotic (Polypheretima elongata). In all systems, the dominant species was B. pearsei, with negligible presence of the exotic species in MM and P plots. 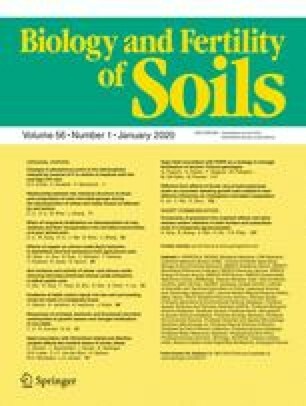 Total abundance was significantly higher in MM than in CM; and earthworm biomass was also higher in MM than in CM and P. Juveniles of both native species dominated, mainly concentrated in the top 20 cm of soil. B. pearsei and L. orbiculatus displayed different preferences (within each agroecosystem) for soil organic matter, N and temperature. Further experiments are required to investigate whether mulching with M. pruriens results in an increased earthworm abundance and biomass through a N-improvement effect or as a result of microclimatic changes and to study the extent to which earthworms and M. pruriens are synergistic in enhancing maize growth. The authors acknowledge Drs. G. Brown, M. Equihua and J.J. Peña-Cabriales for helpful suggestions made during this research that greatly improved this manuscript. In addition, the authors are grateful to P. Nannipieri and two anonymous reviewers for valuable comments and careful revision of the manuscript. A.I.O.-C. acknowledges scholarship support provided by the Mexican CONACYT (Num. Reg. 83463).